Andy Rubin's Essential has nabbed an exclusivity deal for its handset with one of Canada's largest mobile carriers. Telus Mobility will begin selling the Essential Phone, along with its attachable 360-degree camera, this summer at a yet unknown price. Exclusivity and Essential are two words that seem to go hand in hand these days. Andy Rubin's upcoming smartphone was recently announced as a Sprint exclusive here in the United States, and it's now coming exclusively to Telus in Canada too. This new announcement makes Canada and the US the first and only two countries so far to get the Essential Phone—see what I mean about exclusivity? All talk about the 'E' word aside, Telus has also announced a few details regarding the device's availability. The Essential Phone will launch in late summer, both online and in retail stores. Pre-orders will be accepted on telus.com at the end of July. Customers will have the choice of purchasing the phone outright or through one of Telus' Your Choice plans once it is available. Telus did not provide any info on price, except that details "will be shared in the coming weeks." Given that the price of the Essential Phone in the US will be $699, there is a chance that the handset could cost upwards of CAD $900 upfront. "We selected Telus as our preferred partner in Canada due to our strong alignment on the importance of continuous innovation and support for customer choice." "We're excited to be the launch partner for the Essential Phone in Canada. We take pride in carrying the latest smartphones and technology ... This partnership is another opportunity to do just that." Fuller also said he was "pleased" to sell the Essential 4K 360-degree camera, which Rubin believes will be perfect for creating immersive VR video, alongside the Essential Phone. There were no details provided on its price, but it should launch at the same time as the Essential Phone. TORONTO — TELUS today announced it will be the preferred Canadian carrier and retail partner of the new Essential Phone, available in store and online this summer. This premium smartphone is the first to come from Essential, the company recently announced by Android co-founder Andy Rubin. Canada and the United States are the first countries where the phone will be available. Canadians can pre-register on telus.com/essential now to receive the latest information about the Essential Phone at TELUS, including front-of-the-line access to pre-order and exclusive offers being announced in the coming weeks. 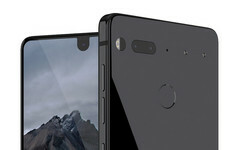 The Essential Phone is expertly crafted using titanium and ceramic, and features an edge-to-edge full display and dual camera system that eliminates any ‘camera bump’ in the industrial design. It also comes with top-of-the-line specs and 128GB of memory. The Essential Phone will be part of a modular ecosystem of accessories, including the world’s smallest 4K 360-degree camera. The 4K 360-degree camera, also to be available at TELUS, simply clicks onto the phone to easily point, shoot and share. In support of our philosophy to give where we live, TELUS, our team members and retirees have contributed over $482 million to charitable and not-for-profit organizations and volunteered more than 1 million days of service to local communities since 2000. TELUS’ 12 Canadian community boards and 5 International boards have led the Company’s support of grassroots charities and have contributed more than $60 million in support of 5,595 local charitable projects, enriching the lives of more than 2 million children and youth, annually. TELUS was honoured to be named the most outstanding philanthropic corporation globally for 2010 by the Association of Fundraising Professionals, becoming the first Canadian company to receive this prestigious international recognition. TELUS has been named to the Dow Jones Sustainability Index for the past 16 years, a feat unequalled by any other North American telecommunications company. As detailed in our TELUS Sustainability Report, our commitment to sustainability is inspired by nature to ensure a healthier future for us all.